I love using lotion for my hand and body. At home I have three different lotions. I was on search for a lotion that will keep my skin moisturize especially on my hand. 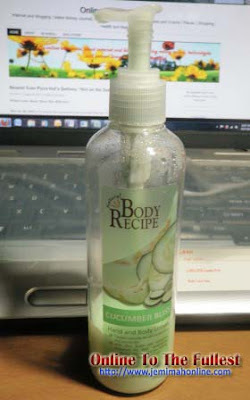 I bought Body recipe cucumber bliss hand and body lotion from HBC last month to give it a try and I can say that the product is good. Why? Let me share my experience about this product. Packaging – in a clear plastic bottle with a natural Smooth Lotion Pump. Lotion scent and color: sweet scent of cucumber melon and has very light green color. It contains naturally-derived moisturizers that nourish skin. With Shea butter and Pentavitin renowned for their conditioning properties leaving your skin feeling soft and smooth after use. The price is competitive. I found it affordable when compared to other lotion products that has the same ingredients. I so love the smell because it has a light sweet-smelling scent that my husband like too. When applied to skin, it truly leaves a soft and smooth effect. The effect on my skin could last up to six to eight hours depending on my activities and weather. It is naturally absorbed when applied through massaging on the skin and it is non-grease. Although it nourishes the skin, I would still use a body butter for my stressed fingertips for extra moisturizing on my dry chapped fingertips. This entry was posted in Health and beauty and tagged cucumber bliss hand and body lotion, HBC hand and body lotion review. Bookmark the permalink.